We use the highest quality mineral make-up on the market today. Come and experience how our make-up will improve your skin conditionówhile providing a natural look that lasts all day. Flawless skin is everyone's dream. 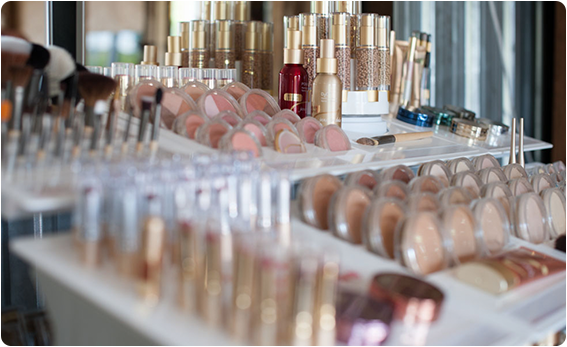 We carry the best makeup available anywhere to make your dream come true - GloMinerals & Jane Iredale. *For makeup applications and classes - please arrive with your face clean and moisturized. Please make sure all mascara and eyeliner are removed. How does GloMinerals compare to other mineral makeup? Our formulations contain Vitamins C, A, K & E plus green tea to protect and nurture the skin. We use a lot of plant based minerals. We offer multiple foundation options (Pressed Base, Sheer Tint, Satin II, etc) and offer a wide variety of colors. We are the only mineral makeup to triple mill our products. It’s a process to create a more refined particle size that ultimately lays better on the skin for superior coverage. For example, think of how pebbles look in a glass jar vs. sand in glass jar. The sand looks smoother and more refined whereas the pebbles do not. Light is able to penetrate through larger particles, and is not able to do so when the particles are smaller. The same holds true for makeup that is not triple milled versus makeup that is. In addition, Glominerals begins with the smallest particles available as a raw material - and then triple mill them. How do we get our colors? Our pigments are derived from mineral mines all over the world. The rocks are pulverized into particles, then sanitized so they can be used in the products. We use: mica from India, titanium dioxide from US, Canada, Australia, iron oxides from India, ultramarines from Germany, manganese violet from Germany, Carmine from Spain. Are our products considered water proof? Does Glominerals makeup contain talc? Talc is the number one ingredient in traditional makeup. Talc is a filler/bulking agent. It clogs pores and suffocates the skin which can lead to acne, exacerbate rosacea and lead to other undesirable skin conditions. We use pure rich pigments from the earth. This means less product needs to be applied to see more product on the skin. Glominerals makeup will lay on the surface of the skin and allows your skin to breathe and function as though you are wearing nothing on your skin. It is more beneficial to wear Glominerals than to wear nothing at all. What is the best way to apply and wear mineral makeup? The #1 complaint about mineral makeup is that is can look heavy. This is because people apply it the same way they apply product with talc. Using our brushes and doing multiple layers of sheer coats allows many levels of coverage. Brushes will alter the coverage of a product. The longer the hair is on a brush, the more sheer the product will be. Proper care for your brushes is very important. We use GloMinerals spray cleaner. This is recommended only if you share your brushes with other people or during a breakout. It is antibacterial and you simply spray the ends of your brushes after each use. Wash your brushes about once a month and following these directions will preserve the life of your important tools. The hairs of your brushes are glued to a wooden dowel inside of the metal rivet. It is extremely important not to let water get in there! Holding the brush with the hairs facing downward wet with warm water. Put a little hydrating shampoo in your hand (the shampoo must be free of sulfates, waxes, and oils - we use and recommend Colorproof Super Rich Shampoo and Condition) swirl the brush around in the palm of your hand - you will see the makeup coming out. Rinse under warm water always keeping the brush facing down! You now must condition the brush! Place a tiny amount of conditioner (must be free of waxes and oils - we use and recommend Pureology Hydrate) in the palm of your hand and swirl your brush in it. Again, rinse holding the brush facing down. You must dry the brushes with them facing downward so no water gets up inside. You also don’t want the hairs to lean on anything - or they will dry with bends in the hairs. To do this: roll up a towel and place the handle on it a little off center so the brush leans down at an angle - but the hairs don’t touch anything. Then place another folded towel over the handles to secure them. The brushes usually dry overnight.